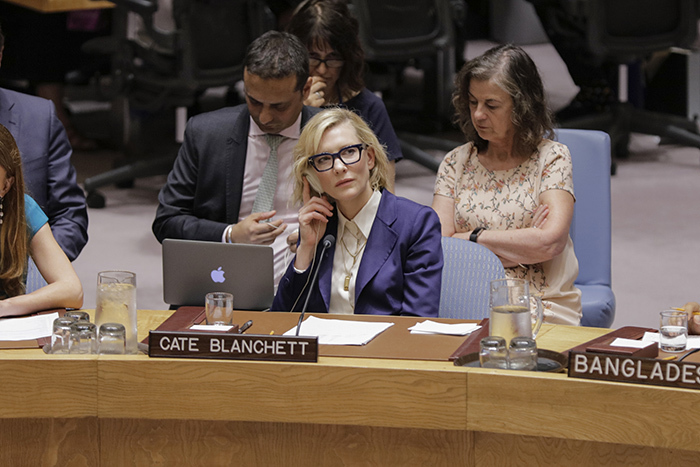 United Nations, New York, USA, August 28, 2018 – Cate Blanchett Academy-award winning actor and Goodwill Ambassador for the United Nations High Commissioner for Refugees (UNHCR), addresses the Security Council meeting on the situation in Myanmar. The meeting commemorates the one-year anniversary of the beginning of the Rohingya crisis in 2017 today at the UN Headquarters in New York City. United Nations, August 28 2018. Actress and UN refugee agency goodwill ambassador Cate Blanchett told the Security Council today that she saw her own children “in the eyes of every refugee child” she met during her visit to Rohingya refugee settlements in Bangladesh adding that their “experiences will never leave” her. Blanchett, who visited Cox’s Bazar in March, said nothing could have prepared her for the extent and depth of suffering she witnessed. She reported on stories she heard by victims of torture and abuse, and people whose loved ones had been killed before their eyes; including children who saw their grandparents locked in houses and set alight. Blanchett said many refugees she spoke with consider Myanmar their home but have real, deep fears about returning there.